Outer Banks Catch is hosting a NC Fisheries Reform Act Summit on Wednesday, September 27, 2017, 10 a.m. to 3 p.m., at the Civic Center in Washington, NC. The 1997 Fisheries Reform Act serves as the framework for the coastal fisheries management process in North Carolina. The Summit will feature in-depth discussions about the Reform Act, its effectiveness in protecting coastal fishery resources and balancing stakeholder interests, and its capacity to address new and emerging issues impacting coastal resources. For more information, visit https://www.outerbankscatch.com/fisheries-refrom-act-summit/ . 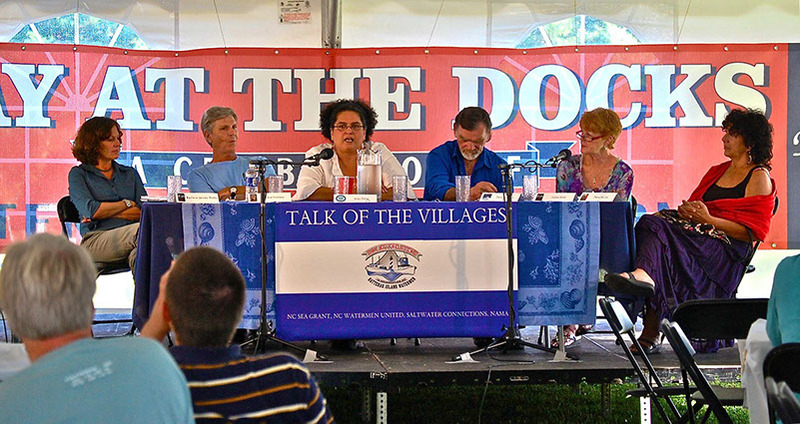 Talk of the Villages is a public forum exploring the challenges and opportunities facing commercial fishing and the seafood industry in the United States. The forum is part of Day at the Docks, an annual celebration of the working watermen culture of Hatteras Island, NC. Garrity-Blake and West have served as co-moderators of forums featuring Alaska, Rhode Island, Louisiana, Massachusetts, South Carolina, and North Carolina commercial fishermen, seafood dealers, chefs, and food writers.